Somehow I managed to accumulate lots of vegan makeup from PHB Ethical Beauty. Quite a few pieces of this makeup came in LoveLula beauty boxes but the rest I ordered separately, just to get a better idea of PHB makeup products and their quality. The makeup from PHB Ethical Beauty is not only vegan but it’s also certified cruelty-free. On top of that, it’s also halal-certified and natural & organic (but it’s not certified organic). If you are looking for a natural makeup which is vegan and cruelty-free you should really consider PHB Ethical Beauty as their range of makeup is so extensive, featuring everything from lipsticks and eye shadows to eyeliners, BB creams and natural foundations. I don’t think I came across a green beauty company which offers such a huge range of natural makeup products. There is something for everyone, that’s for sure. 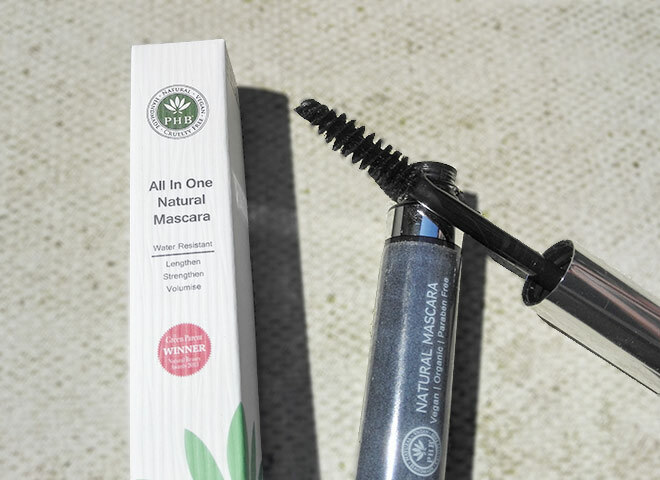 PHB Natural Mascara is loved by many green beauty bloggers and many of them claim that it’s the best natural mascara out of all that they’ve tried. I do like PHB mascara as well as it really makes my eyes stand out, the effect it produces is amazing and it’s better than any other natural mascaras that I’ve tried. PHB mascara thickens and lengthens my lashes well and it doesn’t smudge. Comparing to Green People Volumising Mascara, the brush is slightly bigger, which I can deal with although I prefer smaller brushes as they are easier to use. PHB mascara is free from artificial ingredients such as parabens, Petrochemicals, Methylisothiazolinone, Phthalates, Colourants, Silicone, Mineral oils and Propylene Glycol. But it does contain preservative Phenoxyethanol which some people like to avoid (but it’s not been proven to be harmful in any way). If you are a new LoveLula customer you can save 15% on Odylique products, (you also get a free gift), just click here and wait for the pop up to appear). 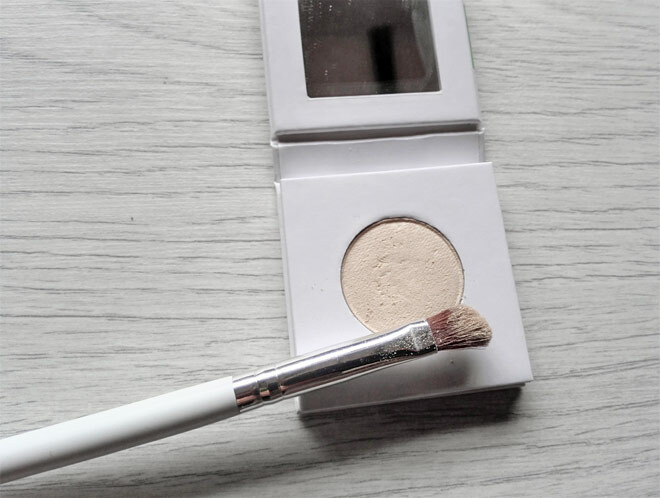 I don’t tend to use eye shadows too much as they normally end up in the creases of my eyelids but I still love PHB Eye Shadow in Almond which comes with a small mirror. Although in the picture, the eye shadow looks like it’s kind of beige/cream colour, when you apply it, it’s actually really light and it appears white actually. I use it in the corners of my eyes and as a highlighter and it works really well for these purposes. When applied to the corners of my eyes, it makes my eyes bigger and stand out more, it creates a great effect. The pigment of the eye shadow is great and it stays put for a long time. This eye shadow came in one of the last year’s LoveLula beauty boxes together with the PHB Eye Shadow Brush. I love both products and I am happy to recommend them. If a lighter eye shadow is not something that you would normally use, there are also other shades of PHB eye shadows available such as ‘Chestnut‘, ‘Dove Grey‘ and ‘Ocean‘. If you like to use all kind of colours you can also go for PHB 18 Piece Professional Pallet which does not only include eye shadows but also lipsticks, blushers, a bronzer and a finishing powder. When I received PHB Brown Eyeliner (in last year’s August LoveLula beauty box) I wasn’t that excited as I normally use a black eyeliner, not a brown one. Nevertheless, I decided to give it a try and I was pleasantly surprised. Although the eyeliner is brown and not black, it’s still quite dark and helps to define your eyes very well. It creates a more toned down look for the daytime although still very strong. As it’s brown it can also be used on your eyebrows just to give them a bit of the ‘wow’ factor. But it’s a bit too dark for my eyebrows which are light brown in colour. This PHB Eyeliner actually won Best Natural Eye Liner Gold Award at the Green Parent Natural Beauty Awards 2014 so it’s worth considering if you need a new eyeliner. The PHB Eyeliner glides on easily and smoothly and it’s suitable for super sensitive skin that reacts easily (great for contact lense wearers). The product contains organic ingredients and is free from palm oil. I like it because it doesn’t smudge when I wear it as some other natural eyeliners. If you prefer black eyeliners, there is also a black version of PHB eyeliner available. Although I already own a stick concealer (Odylique organic concealer), it’s only recently that I started using this type of makeup and thought to try PHB brand as well, just to see how it compares to Odylique. Now I use a stick concealer pretty much every day so it’s something I will use up in no time. No harm to have two, right and besides I’ve already used half of Odylique’s concealer! Anyway, I quite like PHB Cream Concealer Stick. It glides on smoothly and more easily than the Odylique concealer. It’s creamier and I think that’s why it feels easier to apply. On the skin it doesn’t look cakey and it blends in effortlessly. In terms of coverage, it’s comparable to Odylique concealer but I think Odylique’s coverage is slightly better. The PHB stick concealer is suitable for all skin types and it’s great for sensitive skin and acne. It’s naturally radiant, reflecting light to minimise the appearance of blemishes, dark circles and fine lines. Although the PHB stick concealer doesn’t contain the healing calendula (which Odylique concealer contains), it contains healing argan oil which moisturises skin and helps to reduce the appearance of imperfections. All in all, PHB Cream Concealer Stick is pretty good and cannot really find many faults with it. It would be great for those who are looking for light to medium coverage. After years of using natural mineral foundation from My Beautiful Earth, I decided it was time to try something different. That’s because I didn’t feel the foundation was of the same quality as years ago and also, every time I ordered, the colour was not exactly matching my usual choice. So I decided to give PHB Mineral Foundation a try. Since I needed a new kabuki brush I decided to go for the Mineral Foundation & Kabuki Brush Set. The colour I decided to pick for PHB mineral foundation was Medium Rose which is also the most popular selling colour. Luckily, this colour is an almost perfect match for my skin. If you are not sure which colour you should go for, you can always purchase some samples, just check out this page. When I first applied PHB Mineral Foundation, I was unbelievably happy with the results, so much better than My Beautiful Earth! Just to keep in mind, as with any mineral foundation, your skin should be exfoliated and well moisturised before applying, just to avoid the powder clinging onto dry skin (which doesn’t look very nice!). PHB vegan kabuki brush also impressed me. I’ve never used such a soft kabuki brush before! It’s retractable which I especially love as this makes it much more portable. All in all, this PHB set is great and I highly recommend it. Finally, I review the PHB lipstick in Raspberry. I’ve never tried a colour like Raspberry for the lipstick before but after seeing it online I had to have it. It’s just a really gorgeous colour that would compliment any skin tone. Not a big deal for me though, I still loved the lipstick. It contains shea butter to moisturise and protect your lips but it’s not as creamy as some other natural lipsticks that I tried. It also contains vitamin E which is not only great for preventing dryness but also for preventing ageing on your lips. The PHB lipstick is free from carmine and the colour is buildable so you can wear it day time or night time. I love wearing it any time of the day although being quite blonde, the lipstick looks pretty bold in the daytime if I apply too much. Although the lipstick contains some moisturising ingredients, to me it doesn’t feel too moisturising. Many times I feel I have to apply a lip balm either before or after the application. PHB Ethical Beauty offer a good selection of various lipstick shades, just browse this section here to see whether you can find something that would suit you. I am really happy with the Raspberry shade that I picked as it suits my skin tone and it wears off beautifully. That’s not to say it doesn’t stay on the lips for long because it does. At the moment I have some vegan makeup from PHB (from LoveLula beauty boxes) which I am not planning to use and that’s their black liquid eyeliner and their lip crayon in Peach (can be used as a lipstick as well). I’ve heard some good things about PHB Black Liquid eyeliner but I think I read somewhere that it takes a bit of time to dry (so you need some patience!). But apparently, it’s really good for sensitive eyes that water easily. 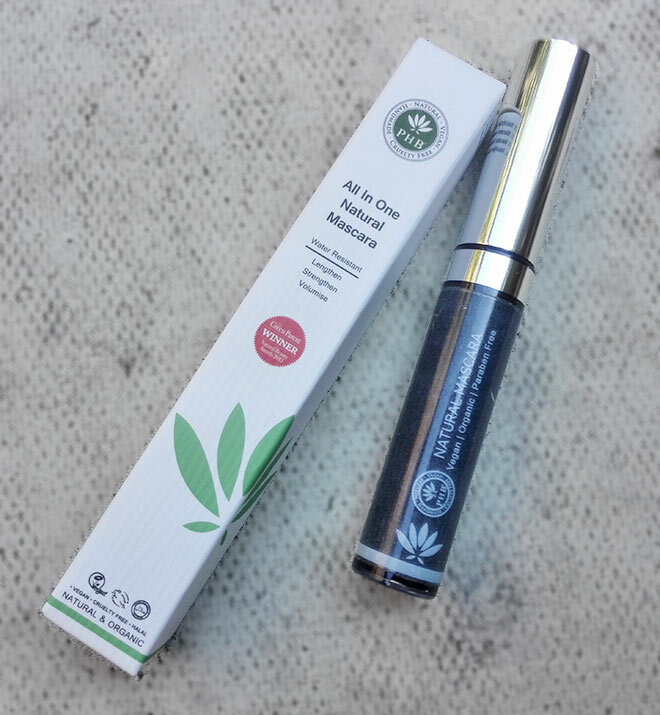 If you are looking for a vegan black liquid eyeliner, you may want to check PHB one and see whether this is something you would like to try out. I feel the same with lip crayon as I do with liquid eyeliner – not something that I would use but I know some people would be interested in giving that a go. Check it out on LoveLula here. Do you own any vegan makeup from PHB Ethical Beauty? Or do you use other vegan makeup brands? I would love to know what you use! Disclaimer: This post contains affiliate links which means that I may get rewarded commission if you purchase a product after clicking on a link. This does not cost you anything. These items have been gifted to me as part of LoveLula Approved Blogger Programme – many of them came in LoveLula beauty box which I used to receive monthly. Quite liking the sound of the brand, though it’s a shame the lipstick wasn’t a little more moisturising and long lasting (I often find the need to use a balm with a lippy then reapply regularly). Great post, you’ve covered the products really well! Well, the lipstick wasn’t too bad, it does stay on the lips for a while and it wears off beautifully although you still need to top up the colour regularly to maintain its strength. I think the lip balm is essential in winter. Glad you enjoyed the post! Thanks for subscribing Sapphira, really happy to hear that! I might going to look for this brand in Hungary as I have received my basic makeup artist degree 🙂 and on myslef I would like to switch for organic cosmetics. Have you tried weleda? Or Dr.Hauschka? I am not sure whether this brand is available in Hungary but you can easily order it online (through LoveLula) and the delivery is free (over £15). I’ve tried Weleda products before – I love their Skin Food and their lime deodorant but I don’t think they do any makeup products? I don’t use Dr. Hauschka but have tried some of their samples. I really like the sounds of that eyeshadow! The shade looks lovely! It’s not a bad shade!